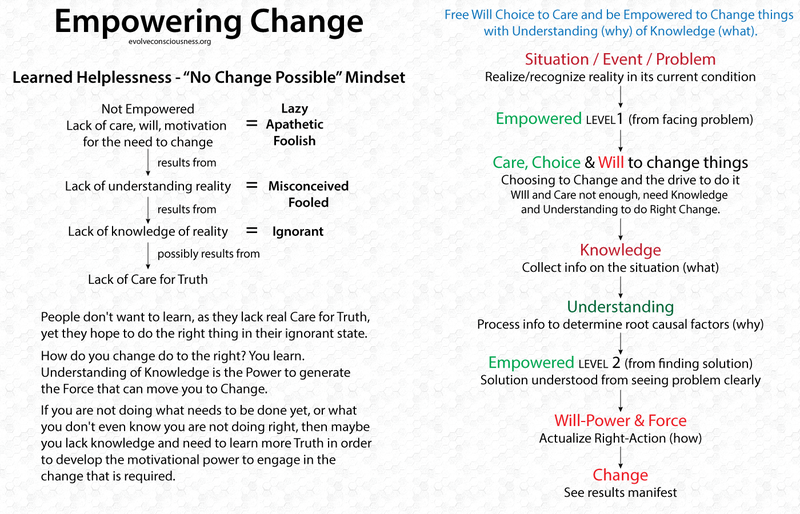 Free Will Choice to Care and be Empowered to Change things with Understanding (why) of Knowledge (what). Lack of knowledge, understanding, care, will-power or courage indicates unconsciousness to some degree. People don’t want to learn, as they lack real Care for Truth, yet they hope to do the right thing in their ignorant state. How do you change do to the right? You learn. Understanding of Knowledge is the Power to generate the Force that can move you to Change. If you are not doing what needs to be done yet, or what you don’t even know you are not doing right, then maybe you lack knowledge and need to learn more Truth in order to develop the motivational power to engage in the change that is required.